This coat is made in the USA. The Panache camel fleece dog coat is made of a luxuriously soft, yet heavy, thick, breathable 300 count polar fleece fabric, for maximum warmth. ( 100 % polyester ) This fleece will not pill, it will not shrink and the color will not bleed. Our signature coat sports a rib knit turtle neck that rolls down for extra warmth, and is ideal for all neck sizes. Designed for maximum protection to ensure your dog is covered from neck to tail, with a chest protector, and an adjustable belt for a snug fit. Easy on and off, machine washable. Be sure to click the “Additional Information” tab to the left to see much more. Ideal for temperatures to 30 degrees. ( please look at our denim coat if you need a sub zero warmth ). Read more about the special features of the Panache coat. The topline is the only measurement you will need for our coat. To ensure the best fit, measure your dog’s topline from A, where the collar would lie, to B, the base of the tail, see chart below. 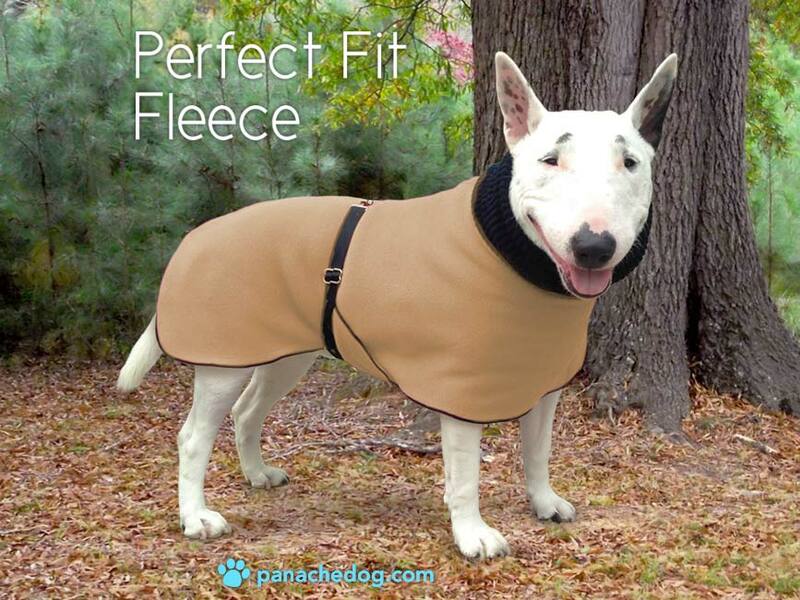 We offer a wide selection of different coats from small to X large dogs. We also offer coats for large breed dogs with big heads. We use only brass or stainless steel hardware, and all our coats have leash holes. Firstly our coat is designed to go over almost any size head, due to the stretchiness of our fleece fabric, combined with our unique ribbed neck, which works very much like a polo neck. The turtle neck (although very stretchy), fits snugly to the neck, unfolds to twice its length to protect the ears, or folded down, for additional warmth. We have designed the front of the coat with a double layer of fabric, which protects the chest, the most vulnerable area. Our chest protector covers the entire chest, and is always made of a double layer of fabric; this combined with an additional layer of fabric that falls to the knees ensures maximum protection at the front. We have tailored the back of the coat to protect the hindquarters for maximum coverage, and ends at the base of the tail. The fleece coat has a black rib knit collar, black trim, and a black belt that goes around the belly, thus creating a snug fit. 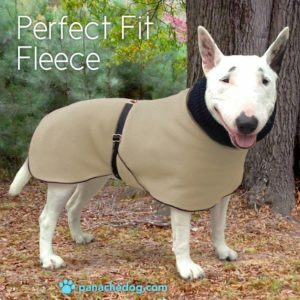 We use only the best quality fabrics; our polar fleece coats are a 300-count fleece, the heaviest and warmest fleece on the market. Our coat is fully washable and can be tumble dried, with care it will not stretch and last the lifetime of your dog. All coats have a leash hole located a couple of inches down from the turtleneck. Belt hardware is brass or stainless steel, NEVER plastic or velcro. 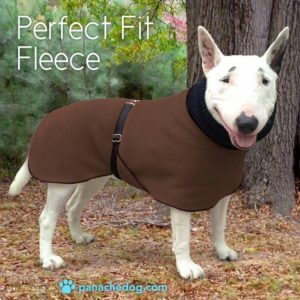 We offer a large selection of sizes to ensure you get the best possible fit for our dog, including coats for large and X large dogs, and for bully breeds with big heads.